After a spring season that he calls the low point of his entire career, John Degenkolb's Tour stage was exactly what he needed. John Degenkolb had been there before, at the pointy end of a race rolling over the pavé approaching Roubaix, but this time was different. Stage 9 of the 2018 Tour de France paid homage to Paris-Roubaix, the “Queen of the Classics,” with a route that traversed many of the legendary cobbled stretches of the spring monument. With just under 20 kilometers to go in the stage this past July, Degenkolb (Trek-Segafredo) was hovering near the front of the pack when Quick-Step’s Yves Lampaert hit the gas. Degenkolb and BMC’s Greg Van Avermaet upped the tempo to match his pace. Degenkolb, winner of Paris-Roubaix itself in 2015, found himself in a familiar spot. He was off the front on the cobblestones with the same duo he escaped that spring en route to capping off the best classics campaign of his life. Three seasons removed from that career year, however, so much had changed. In January of 2016, Degenkolb was seriously injured when a car hit him and several of his Giant-Alpecin teammates during a training session in Spain. He nearly lost a finger in the incident. Instead of defending his titles at Paris-Roubaix and Milano-Sanremo that year, he missed the entire classics campaign. None of his results since then rate as highly as the two monuments he won during that spring to remember. His 2018 classics campaign was yet another disappointment. It wouldn’t have surprised anyone to see the John Degenkolb of 2015 battling with Van Avermaet and Lampaert for a cobbled stage win at the Tour de France, but could the Degenkolb of 2018 deliver? He did, outsprinting the pair at the line and throwing up both hands in a cathartic celebration. The victory was Degenkolb’s first at the WorldTour level since 2015 and his first career win at the Tour de France. It shot him back into the spotlight, garnering media attention for weeks. He says he still gets goosebumps looking back on photos from the day. Looking forward, he knows now that he still has what it takes to battle the best in the biggest races. Here is the inside story of John Degenkolb’s Tour de France stage win. To say that Degenkolb’s spring campaign this season did not go according to plan would be an understatement. Although he started the year with back-to-back wins at January’s Trofeo Mallorca series, Degenkolb fell ill in March. He pulled out of Paris-Nice and then missed Milano-Sanremo for the second time since his 2015 victory. Degenkolb made it to the start line for the rest of his major spring targets but did not finish in the top 10 in any of the cobbled one-days. Robbed of an ideal build-up, he was playing catchup the whole time. “It was the worst classics season I’ve ever had in my whole career,” Degenkolb says, speaking to VeloNews by phone during the off-season. A crash at Paris-Roubaix added insult to injury. He says he was starting to feel competitive again by the cobbled finale, but instead of turning things around like he’d hoped, he was left nursing an injured knee that kept him off the bike for weeks. “That was a pretty low point, not only of the season but also my whole career,” he says. It’s one thing to shake off a short rough patch. Staying optimistic after this many seasons of setbacks was harder. He headed into June uncertain of whether he would even make the start at the Tour de France. After riding the Hammer Series event in the Netherlands, he made his return to WorldTour racing at the Tour de Suisse hoping to work his way into shape, and quickly. The first few stages of racing in the Alps were not encouraging. Something clicked, however, in stage 7 — although you wouldn’t have known it from his result. Nairo Quintana won that tough mountain finale at Arosa. Degenkolb finished 71st on the day, over 25 minutes down. “I was able to really push it until the end, until the last climb. Before I wasn’t capable of doing that. That day really gave me a lot of confidence for the final preparation,” he says. After the Tour de Suisse, Degenkolb headed to Austria for a four-day training block with teammate Michael Gogl. Focusing on strength and endurance, his form continued to improve. Then he headed home to Germany for the national championship road race. A runner-up ride there behind Bora-Hansgrohe’s Pascal Ackermann was further proof that he was healthy and fit. His Tour start was secured. Months prior, the Tour’s cobbled ninth stage had been a target for Degenkolb and his Trek squad. By July, he was just happy to make the start. The first stretch of racing at the Tour offered ample opportunities for the fast finishers. Degenkolb landed in the top 10 five times in the first week. Then, in stage 8, he took third in a close sprint with Peter Sagan (Bora-Hansgrohe) and Dylan Groenewegen (LottoNL-Jumbo). With the Roubaix stage looming, Degenkolb was looking stronger than he had in months. Trek rolled out from Arras for the 156.5-kilometer stage to Roubaix with two leaders: Degenkolb and Jasper Stuyven, who has finished top-five at Paris-Roubaix in the last two years. The main objective was to stay safe into the finale, where both riders would hopefully be in the mix. 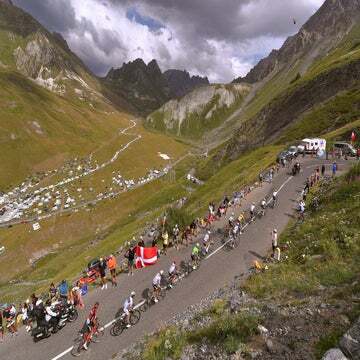 The day unfolded as one might have expected of a cobbled stage in a grand tour, with crashes aplenty ruining the hopes of one GC contender after another. TV cameras bounced back and forth as riders like Mikel Landa (Movistar) and Romain Bardet (Ag2r La Mondiale) desperately chased after mishaps, while several classics specialists and a lucky few yellow jersey hopefuls hung on in the dwindling pack. The early breakaway held out well into the stage as the familiar favorites of Paris-Roubaix mostly eyed each other into the last several sections. The peloton made the catch, however, with around 20 kilometers to go as the race approached the Camphin-en-Pévèle, the day’s penultimate sector of cobbles. Degenkolb and Trek had done their job so far: He was safe and upright in the lead group heading into the final push. With 17 kilometers to go, on the bumpy terrain of the Camphin-en-Pévèle, Lampaert made his move. Live to the danger posed by the Belgian road champion, Degenkolb followed, as did Van Avermaet. The firepower in the move proved strong enough to force a split, which grew as the trio realized that there was a real chance of staying clear. Sagan tried to bridge, but couldn’t. Others, like Sep Vanmarkce (EF Education First-Drapac), were on team duty instead of fighting for the stage. By the end of the final cobbled stretch, it was clear that the winner would come from the three-man group off the front. They took a full minute into the last few kilometers. As rough as his spring had been, Degenkolb had reason to believe that this might finally be his chance to turn things around. The Tour stage concluded not on the velodrome track but with a more traditional finishing straight. A sprint seemed likely nonetheless as none of the three made any decisive attempts to break clear. Degenkolb found himself in the unenviable position of sitting at the front of the trio after unsuccessfully trying to get his companions to come around inside the last kilometer. Forced to lead things out, he wound up to speed 250 meters from the line. Van Avermaet was glued to his wheel, but he never came close to coming past. Degenkolb held out all the way to the finish to win his first Tour stage. He pointed to the sky as he crossed the finish in tribute to a family friend who had passed. It was a tribute he’d wanted to the make for months if only he could find the opportunity in a big race victory. Now, on the sport’s grandest stage, he had it. The German was overcome with emotion at the finish. “I was chasing this victory for so long. It’s really hard to describe,” he said, fighting back tears in a television interview. Degenkolb’s emotional Roubaix victory was enough to earn him plenty of media attention long after his tearful post-race interview. “Especially in Germany, it means so much if you win a stage at the Tour. I think I got more attention winning a stage in the Tour than winning actual Paris-Roubaix in 2015,” he says. It was nice to be getting positive coverage again. Crediting his family and the Trek squad for continuing to support him despite the tough stretches, Degenkolb says he was glad to have a chance to send his doubters a message this summer. Degenkolb proved that to himself as well this summer. The bona fide classics remain his top targets for 2019, and he knows he has work to do to get back to winning ways in the one-days. He came close to another stage win in the final day of the Tour, finishing second to Alexander Kristoff on the Champs-Elysees, and delivered a handful of other strong results in the remainder of his 2018 calendar, but he says that he’d hoped for more out of the second half of his season. Nonetheless, a stage win in the sport’s biggest event was more than enough to send him into the offseason with a renewed feeling that he has what it takes to contend with the very best. Degenkolb is quick to acknowledge that a Tour stage on the Roubaix cobbles is not Paris-Roubaix — but it was a big win against big classics stars in cycling’s biggest event. That counts for something. “It definitely refreshed all the confidence and the trust in myself to be up there to compete against all the really big guys, to be one of those who fight for the [Paris-Roubaix] cobblestone,” he says.